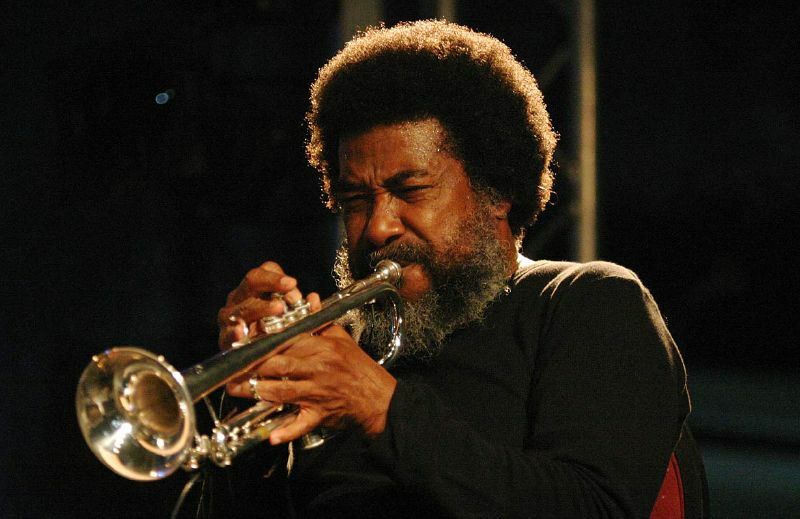 Those who follow this site regularly probably know by now that one week from tonight The Lab will host the beginning of its two-day CREATE festival dedicated to avant-garde trumpeter Wadada Leo Smith. Note the absence of either “jazz” or “classical” as a modifier for “avant-garde.” Smith’s approaches to making music show little regard for genre boundaries; and the programming for CREATE will have him leading five different ensemble performances. It will also include a performance of his twelfth string quartet. However, Smith’s solo work is as significant as the diversity of ensembles with which he has performed (and, presumably, will continue to perform). As a result, one of the more significant events in the recording industry (at least to me, if not to those who compile the GRAMMY nominations) was the release by Finland-based TUM Records Oy of Smith’s solo album Alone: Reflections and Meditations on Monk. Of the eight tracks on this album, four present Smith’s interpretations (reflections) of compositions by Thelonious Monk that are now regarded as standards. The other four are new compositions by Smith that “meditate” on Monk’s life, as well as his music. These days it is difficult to find a seriously inventive jazz musician (regardless of instrument) who does not single out Monk as a significant influences. (Part of my “sample set” for this assertion comes from attending the jazz events given under the San Francisco Performances Salon Series, which always conclude with the performer(s) participating in a Q&A session with the audience.) Having listened to Monk myself at the Village Vanguard when I was first trying to get my head around jazz practices, I can appreciate the iconic status that was granted to him after his death (as well as before by many serious jazz practitioners). Nevertheless, this is a jazz album; and, if Smith were to play Monk the way that Monk played Monk, it would not be jazz! What is important is that all four of the Monk tracks are based on some of the most familiar tunes associated with Monk. These are, in order of appearance, “Ruby, My Dear,” “Reflections,” “Crepuscule with Nellie,” and “’Round Midnight.” In each case the tune is recalled with the same clarity one would encounter in a classical theme-and-variations composition, after which Smith goes his own way, paying more attention to the spirit behind the tune than to the notes themselves. Thus, if these are “reflections,” the “mirror” has been distorted by Smith’s own musicianship; but the “image” is always there, even if in the background, rather than the foreground. This composition is a mystery that came to me in my sleep as is often the case with my compositions. It could be about the two of them at Shea Stadium, or perhaps not. Maybe they took a day trip to the stadium just to check out the new space with Bud Powell having recently returned from Paris to New York – just to sit on the bench and smoke a cigarette. Or, maybe, they actually went to see a ballgame. Or it could be something of a deeper, more mysterious meaning. Smith then concludes his statement with a cryptic reference to Monk’s “Misterioso,” which may do little more than loop back on the appearance of the noun “mystery” in the title. We now live in a cultural context that recognizes that neither Monk’s compositions nor the recordings of his performances deserve to be relegated to the status of “background music.” We approach this music with the same attentiveness summoned when listening to any one of the string quartets of Ludwig van Beethoven. Serious jazz listeners always brought that attitude to a performance, even when it was taking place in a noisy club. To some extent the legitimation of jazz as a concert experience owes much to the formation of the Association for the Advancement of Creative Musicians (AACM) in 1965; and Smith’s AACM membership probably inspired him to found his own Creative Construction Company in 1967. Half a century later, serious jazz listeners do not have to contend with adverse environments as much as they used to do. This has been particularly advantageous for Smith, not to mention some of his Monk-inspired partners in jazz-making, such as Vijay Iyer. There is much to be mined from Smith’s “reflections” and “meditations;” and his solo album will definitely hold up to multiple listening experiences for some time to come.